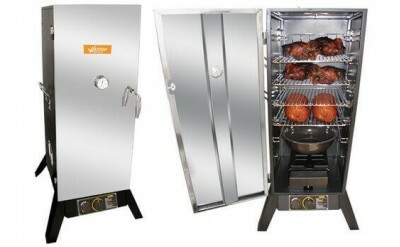 Gas Smokers are the perfect tool to add flavor to any cut of meat. Smoked sausage or beef jerky are easy to make in a gas smoker. One Stop Jerky Shop carries name brand gas smokers that are built to last. Get a gas smoker for your next weekend barbeque and you won't regret it. 36" Vertical Propane Smoker with Powder Coated Sides and Stainless Steel Door - Weston ProductsThis easy-to-use gas smoker lets you adjust the temperature to match the type of meat you are smoking. Rotary dial controls make this smoker as easy to use as your common grill. Comes complete with an exte..
48" Vertical Propane Smoker with Powder Coated Sides and Stainless Steel Door - Weston ProductsThis easy-to-use gas smoker lets you adjust the temperature to match the type of meat you are smoking. Rotary dial controls make this smoker as easy to use as your common grill. Comes complete with an exte..